The approximately 43,000-square foot facility was funded by $4.3 million from the State University Construction Fund; $2.8 million from NYSUNY 2020 funding; $905,688 from New York State Energy Research and Development Authority; $925,000 from Broome County; and $330,000 from Empire State Development and the Regional Economic Development Council. The AMETEK Foundation donated $10,000. Solar panels on the roof of the Calice Advanced Manufacturing Center provide electricity. Assemblywoman Donna Lupardo speaks during the opening of the Calice Advanced Manufacturing Center on Oct. 16, 2018. In addition, the Broome Community College Foundation contributed $3.4 million. This funding was made due to the historic $11 million estate gift in 2014 from the late Emil Calice, who stipulated that any building that received funding from his estate would bear the names of his parents, Paul and Mary Calice, as well as Mildred Barton. Executive Vice President Francis Battisti speaks during the opening of the Calice Advanced Manufacturing Center on Oct. 16, 2018. “Investing in workforce development is crucial to training New Yorkers for 21st century jobs and the Calice Advanced Manufacturing Center on the SUNY Broome campus will do just that, educating the next generation of entrepreneurs to support and spur economic growth throughout the Southern Tier and New York State,” said Empire State Development President, CEO & Commissioner Howard Zemsky. 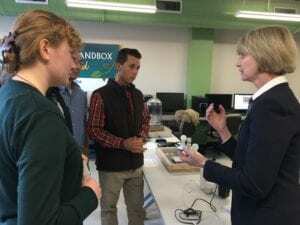 SUNY Chancellor Kristina Johnson speaks with SUNY Broome Engineering Science students in the Calice Center’s green energy classroom, the Sustainability Sandbox, on Oct. 16, 2018. Broome County Executive Jason Garnar speaks during the opening of the Calice Advanced Manufacturing Center on Oct. 16, 2018. 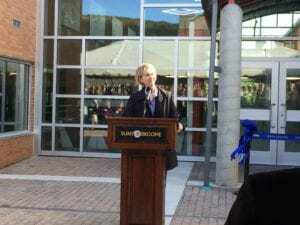 SUNY Chancellor Kristina Johnson speaks during the opening of the Calice Advanced Manufacturing Center on Oct. 16, 2018. A high-tech soldering lab funded by Empire State Development and equipped by the AMETEK Foundation. Renovated drafting, surveying, soil mechanics, thermodynamics, and fluid mechanics laboratories, as well as materials and metrology and welding labs. 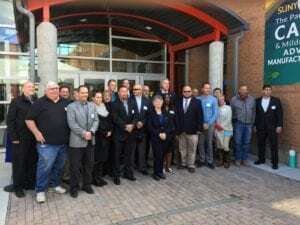 SUNY Broome alumni during the opening of the Calice Advanced Manufacturing Center on Oct. 17, 2018. An advanced manufacturing lab with its own computer control room. A clean room funded by NYSUNY 2020 with its own gowning room and air lock. New fermentation and food processing laboratories, geared toward the Southern Tier’s role as the state’s food hub. The contractors and funders who made the Calice Advanced Manufacturing Center possible. provide education opportunities for students through a sustainable energy learning lab and control room. Italian immigrants, Paul and Mary Calice ran a corner store in Binghamton. Mildred Barton, Emil Calice’s companion of many years, was a passionate naturalist and gardener, as well as a philanthropist. Emil Calice, who served during World War II with his brothers, spent his career with IBM. He never attended SUNY Broome himself, although several of his and Barton’s relatives went on to graduate from the college. Broome Community College Foundation President Margaret Turna speaks during the opening of the Calice Advanced Manufacturing Center on Oct. 17, 2018. Patrick O’Shei from NYSERDA speaks during the opening of the Calice Advanced Manufacturing Center on Oct. 16, 2018. Chemistry Professor Harold Trimm, SUNY Chancellor Kristina Johnson and Dean of STEM Michele Snyder in the Calice Center’s food science labs on Oct. 16, 2018. Work on the Calice Center began in the summer of 2017. The building opened for classes at the start of the Fall 2018 semester. The architect behind the project is Passero Associates of Rochester, while McFarland Johnson of Binghamton is the engineer and LeChase Construction Services of Binghamton the construction management firm. Streeter Associates Inc. of Elmira is the general contractor, while Postler & Jaeckle of Endicott is the HVAC contractor, Petcosky & Sons Plumbing & Heating of Vestal is the plumbing contractor, and Nelcorp Electrical Contracting of Endwell the electrical contractor. Donna Howell of Empire State Development speaks during the opening of the Calice Advanced Manufacturing Center on Oct. 16, 2018.
community outreach programs in the 2016-17 academic year. SUNY students and faculty across the state make significant contributions to research and discovery, resulting in $1 billion of externally sponsored activity each year. There are 3 million SUNY alumni worldwide, and one in three New Yorkers with a college degree is a SUNY alum. To learn more about how SUNY creates opportunity, visit www.suny.edu. A visiting Fast Forward chemistry class from Chenango Valley High School during the grand opening of the Calice Advanced Manufacturing Center on Oct. 16, 2018.